"Well, it was a difficult job but I finally chose 'Titanium V' by Paul Milbourn as my choice - and it is clear that I was not alone in my admiration for Paul's work as he went on to scoop the win in the Street Performance Class. Paul went entirely his own way with this design. He chose a fine target on which to focus his ideas - a Moto Guzzi engine - and executed his mission of making the machine as light as possible. The Guzzi is an often over looked and underrated platform for customization but the symmetry of its unique layout delivers possibilities that are very different to other engines. "I felt very honored to be asked again to pick my favourite of the bikes at the 13th AMD World Championship of Custom Bike Building. It is really a hard choice between about 100 very fine custom built motorcycles. This time there were two personal favourites of mine. As I was wondering whether I have to flip a coin, Robin Bradley of AMD helped me out telling that it'll be all right to pick two bikes. I can tell you, I was relieved. The first one of my selection of two is a Knucklehead named SourKraut. It is owned by Jesse Dickinson and built by Jordan Dickinson of Union Speed and Style at Monticello, MN, USA. The heart of this beautiful bike is a Harley-Davidson 1947 EL Knucklehead motor. The rigid frame is a Union Speed and Style work and the front end is a narrowed Harley-Davidson VL fork. The laced wheels are a classical combo of 19" front and 16" rear, both with old school tires. "I'll be the first to admit that I approach custom bikes from the traditional end of the spectrum, and as a rider rather than a builder my editor's choice will always be an aesthetically beautiful bike that I would want in my garage, fuelled-up and ready to roll. After much soul-searching, I managed to reduce this most diverse collection of motorcycles that I've ever seen assembled into one place down to five that "speak to me", and subsequently down to two once I had accounted for the riding position: Union Speed and Style's 1940's concept Knuck and Abnormal Cycle's 101 Scout-framed UH. Hendersonville, North Carolina based Fast Bike Industries, LLC (FBI) has announced its appointment as the official North American distributor for the leading edge, British made suspension range from Nitron Racing Systems. David Behrend, owner of FBI says that "the addition of Nitron is in keeping with our mission to distribute the best brands and products to dealers and their riders - those seeking high-performance high-quality aftermarket motorcycle suspension with a genuine race pedigree." Although best known for sports bike shock absorbers and front-end cartridge kits, Nitron also offers a range of feature variant Harley aftermarket and custom V-twin suspension products at a selection of price points - all of which are manufactured at its state-of-the-art facility in the UK. S&S Cycle is the home of "proven performance", and continues to prove it with their second straight Grand National Championship aboard the Indian FTR750. The performance exhaust that powers these machines to podium wins has also inspired systems for street going bikes and their latest is designed for the new line of HD Softail models. OptiMate SOLAR, getting the Drag Specialties motorcycles 'ready to ride' at Sturgis! TecMate's advanced OptiMate brand Solar battery charging tools have been gaining traction in the market place rapidly since their introduction. At this year's Sturgis Motorcycle Rally in the United States the company was set up with Drag Specialties / Parts Unlimited - the company's exclusive North American distributor. Though there primarily to help the sales team promote the OptiMate range, with some sales of the Solar chargers being made - especially to people who had transported their bikes in closed trailers - one classic opportunity to showcase their Solar products came with the show bikes that TecMate's distributor uses at events within the USA. 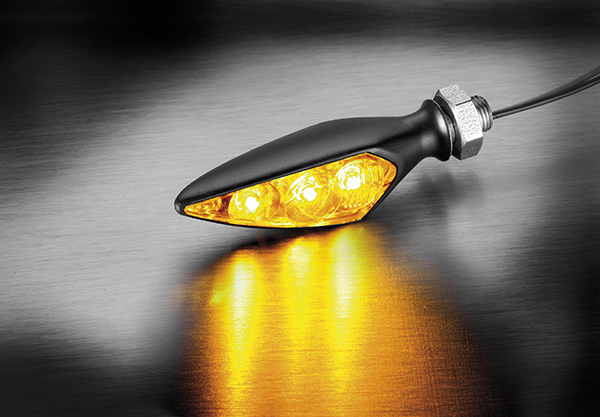 German lighting and advanced electrics specialist Kellermann has miniaturised its popular micro Rhombus LED indicator - it is now smaller, brighter and still with the characteristic design edge that has made it so popular with customisers and builders. The Aachen based manufacturer is internationally recognised for its innovation and quality and is offering its super compact Rhombus S as a 3-in-1 option 'Rhombus S DF Dark' - indicator, rear and break light - and as indicator only 'Rhombus S Dark', both with tinted glass.